What’s growing in leaps and bounds and lets you “flee” from your boring old vehicle? What else, but a Ford Escape? 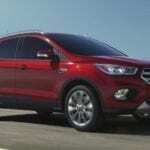 This five passenger compact crossover SUV remains a hugely popular vehicle among all ages prompting it be Ford’s second best-selling model behind the Ford F-150 pickup truck. And now it is posting record-setting sales for the first five months of 2017, the best start in Ford’s history. Its Louisville, Kentucky assembly plant usually gets a two-week reprieve on the production line in the summer. Not this year. To keep up with this brisk demand, the plant will only be closed one week, not two, in order to build more than 8,500 additional vehicles. Through May, Ford Escape sales totaled 129,805 vehicles with a 3% increase versus the same period last year – Ford’s best ever start to the year for Escape. Retail sales are up 6% versus last year’s sales. Retail customers continue to be the Escape’s biggest consumer. But what is driving consumers to buy the 2017 Ford Escape crossover as opposed to other competitors in the market? Families and couples enjoy how the Escape allows them to run their errands, fit a flat-screen television into the trunk, take the kids to soccer practice, or travel comfortably on vacation with all of their cargo. No matter your budget, there’s an Escape trim for you: the S, SE, and Titanium, along with a Sport Appearance package for those seeking a more aggressive look. This year’s model has been refreshed, offering a stylish exterior and interior, multiple powertrain options, lots of space for passengers and cargo, and a wide variety of technology, convenience, and safety features. All of these features play a big role in its huge success. One of the biggest draws for any driver to a particular vehicle is its performance. It makes sense since that’s what makes the car move. In the case of the 2017 Ford Escape, it’s been given a powerful new EcoBoost engine in three levels: the new 1.5L EcoBoost turbocharged four-cylinder engine provides 23 mpg in the city and 30 mpg on the highway; a standard 2.5-liter four-cylinder engine paired with six-speed transmission and independent variable cam timing produces 168 horsepower at 6,000 rpm and 170 lb-ft of torque at 4,500 rpm; or the optional more powerful and larger top-of-the-line 2.0L EcoBoost engine. This engine produces 245 horsepower and 275 pounds-feet of torque. Drivers will be pleased with its fast 0-60 mph in a speedy 6.5 seconds. 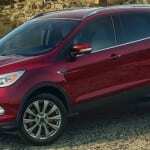 Driving the popularity of the Ford Escape is its host of technology advancements. Owners are telling prospective drivers about its intriguing technology options. The 2017 model offers such pleasant goodies as Apple CarPlay and Android Auto, as well as Ford’s new Sync 3 voice recognition and communication infotainment system – loaded with apps. There’s even a SYNC Connect app that allows you to lock, unlock and start (when equipped with remote start), the Escape crossover using a smartphone app. If you’re taking the Escape on a trip, you’ll appreciate its voice-activated navigation system and new adaptive cruise control. For busy parents who are loading the trunks with their hands full, the foot-activated power tailgate makes loading sports equipment, luggage, and groceries easy. Another key ingredient to the allure of the 2017 Ford Escape is its environmentally-friendly attitude. By being equipped with the new auto start-stop technology, the Escape saves gas, engine wear, and the environment. Anyone who cares about the Earth will be impressed with this new model. When you want to differentiate your new model from the competition, let your designers give it some punch and styling. Ford has delivered the 2017 Escape with a handsome new front and rear styling, along with redesigned mirrors for added aerodynamics. Passengers will enjoy its quiet solitude due to the addition of new acoustic glass and an underbody shield. Owners will appreciate having a variety of signature paint colors to choose for their new Escape including Canyon Ridge, Ruby Red, and Lightning Blue. The stylish interior is yet another reason that customers have been gravitating toward the new Ford Escape. Its spacious design includes a reclining backseat for those who need to take a nap on a long road trip. You might even forget that you’re riding in a crossover SUV. Ford designers have included such special touches as ambient lighting and an optional panoramic roof. For those who require cargo room, the 2017 model has added more storage areas in the front passenger compartment by relocating the shift lever and adding an electronic parking brake. It offers 34 cubic feet of cargo space in the back. Of course, one of the prime indicators of a popular vehicle is its safety technology. The 2017 Ford Escape does not disappoint. It offers a wide variety of crash prevention and safety technology, including adaptive cruise control and forward collision alert that primes the brakes if an emergency stop is needed. During routine driving, its new powerful braking system using auto start-stop technology lets the turbocharged engine shut down when the driver comes to a complete stop. You’ll also appreciate its lane-keeping system that alerts you to unintentional lane drift and helps to steer you back into your lane. Finally, the blind-spot information system with cross traffic alert uses radar to identify vehicles in your blind spot and indicates with a mirror-mounted light. Blind spot mirrors also alert you to crossing traffic as you back out of a parking spot or driveway. Parents who have teenage drivers will feel more at ease letting their kids drive the 2017 Ford Escape. That’s because it is equipped with the Escape’s MyKey system to prevent their children from speeding and driving irresponsibly. It’s no wonder that Ford has had to add extra production weeks at its facility to accommodate all of the orders for its 2017 Ford Escape. 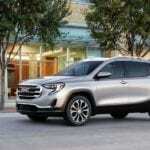 This latest model has enough new features to draw young couples, singles, families, and older adults to its compact crossover SUV allure.